Seclira® Pressurised Insecticide makes the ground-breaking advantages of the Seclira WSG formulation available in a pressurised pack for more convenient and precise application into cracks and crevices. Seclira Pressurised Insecticide is a fast-acting, non-repellent, ready-to-use product with System III® compatibility for the control of a broad range of pests including ants, and cockroaches. It dries clear and odourless, so it can be used in a wide range of situations. Seclira Pressurised insecticide’s unique non-repellent active ingredient will control pyrethroid-resistant pests quickly and is powered by Genuine Transfer Effect Technology, making it an ideal product to use in rotation with Phantom® Pressurised Insecticide. Seclira® Pressurised Insecticide provides a unique mode of action – third generation neonicotinoid. This affects the nicotinic acetylcholine binding in a mode that differs from other neonicotinoids, and is found highly active where imidacloprid resistance has developed. Seclira Pressurised Insecticide is effective through both contact and ingestion. 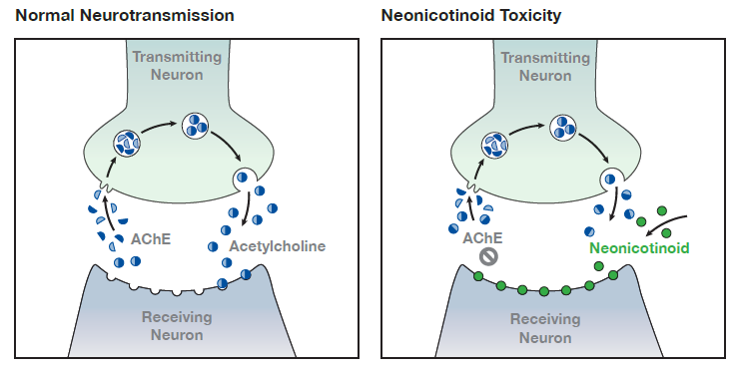 Left: In normal neurotransmission, an the AChE enzyme, (acetylcholinesterase) creates a reaction which breakdown acetylcholine (ACh) and revents overstimulation and blockage of receptors. Right: When Dinotefuran is introduced, the ACh receptors are blocked. This leads to overstimulation and the quick and fatal disruption of the nervous system.